INTEGRATED MANAGEMENT SYSTEMS is therefore the unit that optimizes the integrated communication of corporate processes and acts as reference for any goal, be it a problem or a suggestion, so that the appropriate action of corporate strategic planning can be taken. exhaustive and fast responses to the requirements of customers, complying with the standards for environmental impact, social responsibility, safety of products and of the workplace. it allows the company to consider all the important factors, according to its strategies. integrating systems enables individual improvement to be shared and operated by others. Gruppo Mastrotto operates in compliance with the requirements set forth by the UNI EN ISO 9001:2015 standard, in the following fields of application: design and production of finished leathers for furniture, footwear, car and aircraft interiors, leather goods, clothing and accessories. Gruppo Mastrotto operates in compliance with the requirements set forth by the UNI EN ISO 14001:2015 standard, in the following fields of application: design and production of finished leathers for furniture, footwear, car and aircraft interiors, leather goods, clothing and accessories through tanning, re-tanning, dyeing and finishing treatments. Gruppo Mastrotto operates in compliance with the requirements set forth by the ISO/TS 16949:2009 framework for the following activities: production of finished leather for car interiors. Gruppo Mastrotto operates in compliance with the requirements set forth by the 96/98/EC framework with regards to the maritime fitting sector for EC ships. The ”Gold LWG Award” recognition is an important award bestowed to Gruppo Mastrotto for its good ethical, environmental and safety practice in the processing of hides. The Award was given to Mastrotto Brasil by the Leather Working Group. The Leather Working Group (LWG) is made up of member brands, retailers, product manufacturers, leather manufacturers, chemical suppliers and technical experts that have worked together to develop a environmental stewardship protocol specifically for the leather manufacturing industry. Blauer Engel, the German government certification, proves the ecological quality of the leathers produced by Gruppo Mastrotto. Our leathers are produced with the purpose to minimize their impact on the health and the environment during the production phase as well as in the recycling and disposal phases. 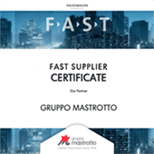 Gruppo Mastrotto was given the Volkswagen FAST SUPPLIER award at the presence of the top managers of all the brands belonging to Volkswagen Group. Volkswagen Group officially agrees to have a privileged relation, a strategic and technologically more immediate dialogue with Gruppo Mastrotto that, as its reliable partner, ensures excellent and profitable best practices able to follow clients in the innovation process and propose new development solutions in the meantime. Gruppo Mastrotto is a key element of the strategy of Volkswagen Group with regards to leather, innovation and globalization, and is authorised to access confidential information not available to other suppliers with the purpose to boost the competitive advantage. Thanks to the constant research of innovative and sustainable solutions, Gruppo Mastrotto is one of the 5 companies chosen to take part to the GREEN L.I.F.E. project (Green Leather Industry for the Environment), financed by the European Commission. Green LIFE’s primary goal consists in reducing the environmental impact of the various segments of the tanning sector.